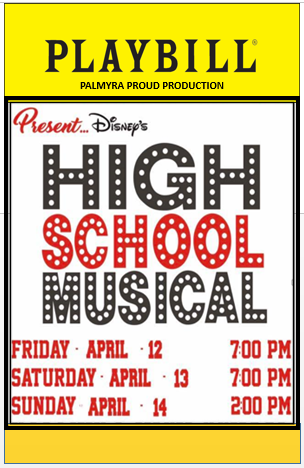 This coming weekend, the Palmyra Players will be kicking off their 2019/2020 season with performances of the play “High School Musical” at Palmyra High School. Performances of “High School Musical” will take place at 7 p.m. on April 12 and 13, and 2 p.m. on April 14 at Palmyra High School. Tickets can be purchased at the door and are $7 for adults and $5 for students. For more information, call or email Lisa Jablonski at (856) 786-9300 ext. 1000 or ljablonski@palmyra.k12.nj.us.